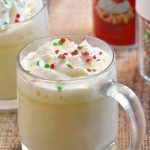 White Hot Chocolate is a rich, creamy and pure comfort food you’ll love to cozy up to on a cold winter day or anytime you need a sweet treat. It’s ready in minutes, has simple ingredients, and can be made in the slow cooker! 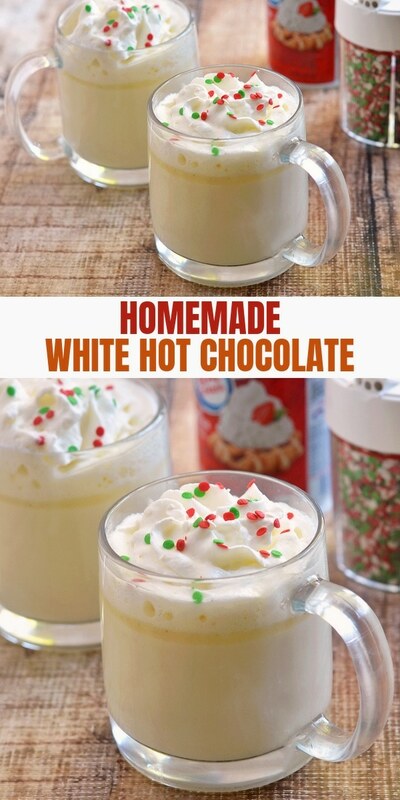 Have you tried my Mexican hot chocolate recipe yet? 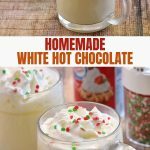 How about my copycat version of Disneyland’s hot chocolate? 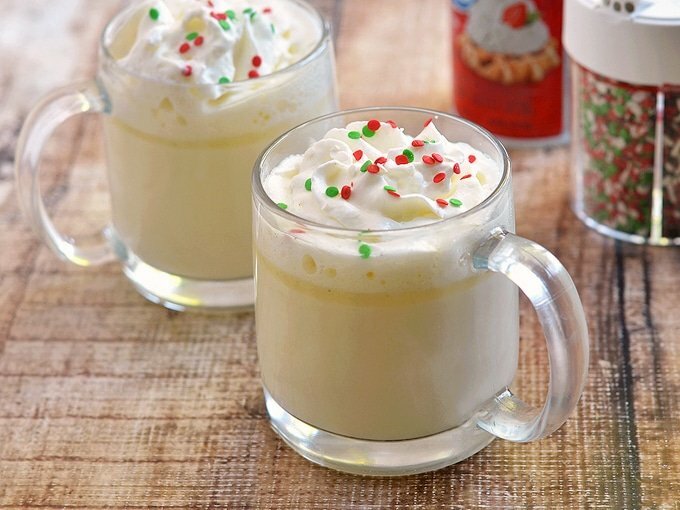 I hope you loved them because I have another ultra decadent hot chocolate for you, in white chocolate form! 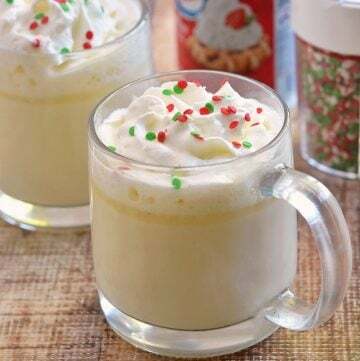 If you’re looking for the ultimate drink to cozy up to on a cold winter day or just about anytime you crave something luxurious, this white chocolate drink is it! 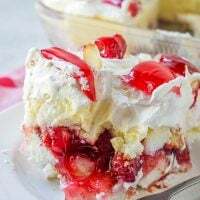 Perfectly sweet, rich, and creamy, it’s pure bliss! This drink is as good as the ingredients you use so splurge on high-quality chocolate. I like to use Ghirardelli premium white chocolate bars or white chocolate chips. Do NOT heat the milk to a boil to keep from scalding it and changing its texture. 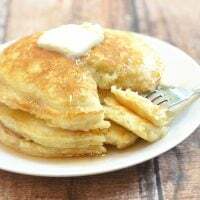 You can use all milk and skip the heavy cream if you like to trim the calories or cut down on the fat. 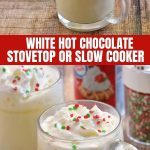 This white hot chocolate recipe is ready in minutes, has fewer ingredients than the powdered form you can buy in the store and can be kept warm or made entirely in a crockpot. 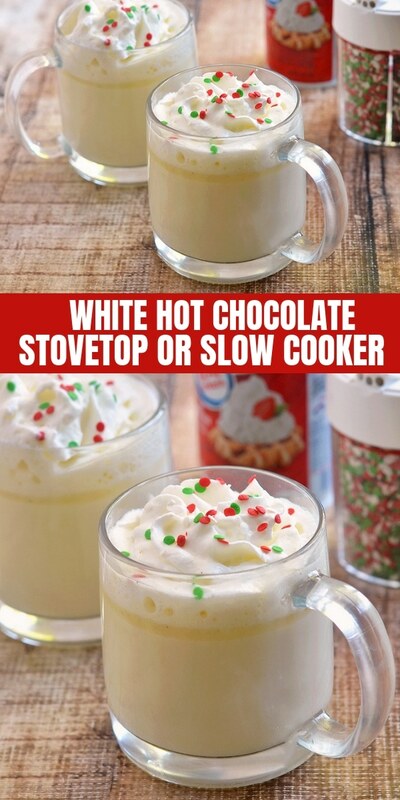 Combine milk, heavy cream, white chocolate, and vanilla in the crock pot. Cover and cook on HIGH for 1 1/2 to 2 hours or on LOW for 3 to 3 1/2 hours or until chocolate is melted and the mixture is hot. Stir every 30 minutes. 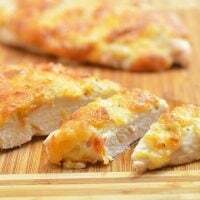 Serve immediately or decrease to KEEP WARM setting. 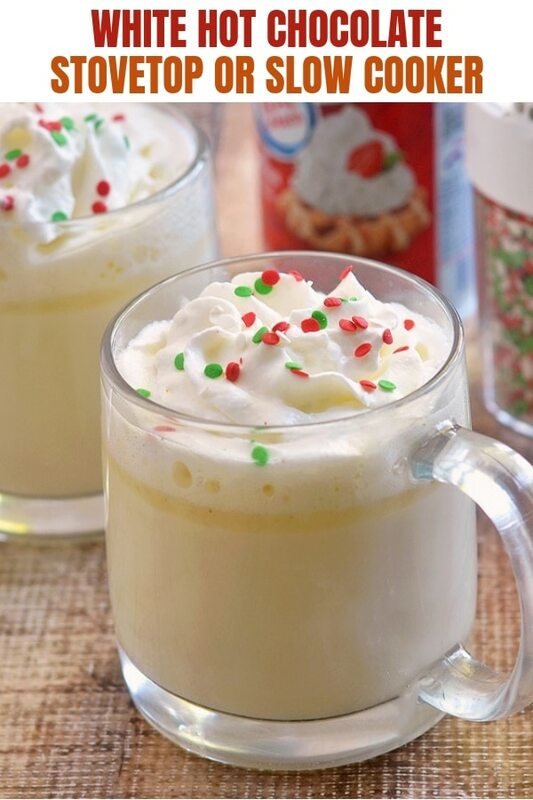 Your holiday guests will love this hot beverage. You can easily double (or triple!) 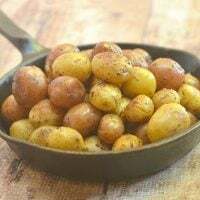 the recipe, keep it nice and hot in the slow cooker, and set out different mix-ins and cups on the counter so everyone can ladle their own and top as desired. Any other topping ideas? Share in the comments below and enjoy a cup (or two, no judgment here) today! 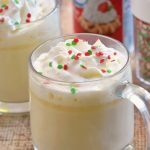 White Hot Chocolate is a rich, creamy and pure comfort food you'll love to cozy up to on a cold winter day or anytime you need a sweet treat. It's ready in minutes, has simple ingredients, and can be made in the slow cooker! 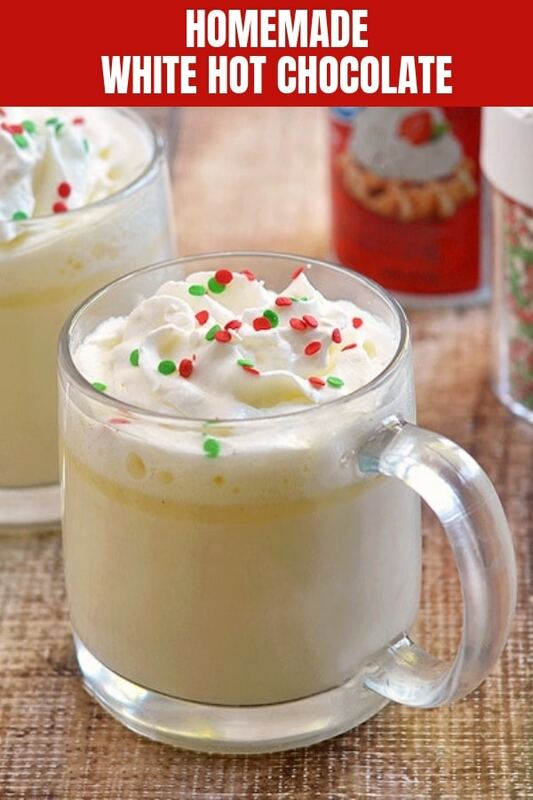 In a saucepan over medium-low heat, combine milk, heavy cream, white chocolate, and vanilla. Bring to simmer, stirring regularly, for about 10 to 15 minutes or until chocolate is melted and the mixture is hot (NOT boiling). 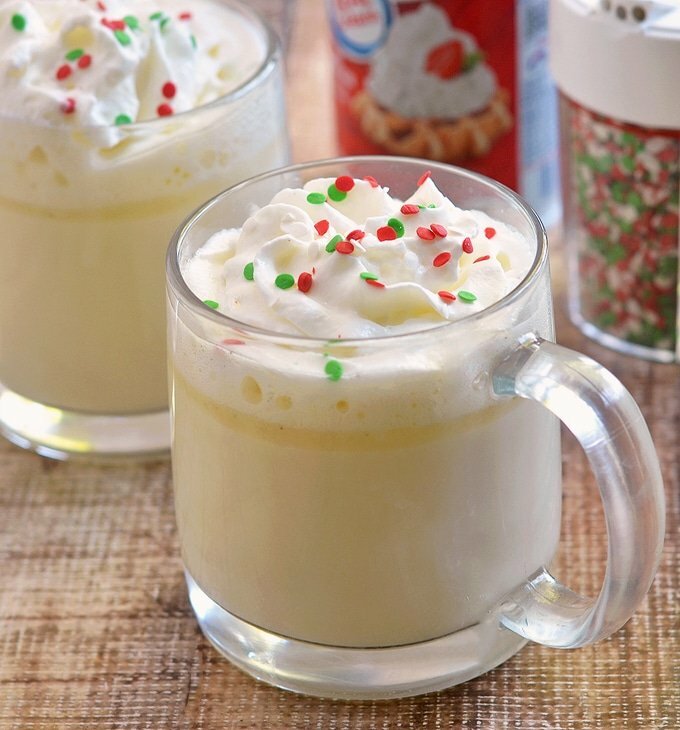 Ladle into cups and top with whipped cream and sprinkles as desired. Serve immediately. A good day for hot chocolate here in the Boston area! First snow of the year. There is actually no such thing as WHITE chocolate as brown cacao makes chocolate. I have no idea what white chocolate is supposed to be.